I have been doing SoulWisdom clearings since 2000, when I learned the process from its creator, Carol Hathor. For more on this innovative and extremely effective method, check out her website. Having your Auric Field cleared can shift your awareness to creating more joy in your life. Carol Hathor, the founder of the SoulWisdom system, says, "The Auric Clearing is performed only once, to absolve major blockages in the seals ("chakras") in order to prepare a person's psyche for deeper work with their subconscious mind." Reconnect you to a part of your Soul Self that has most likely been disconnected for many lifetimes.. 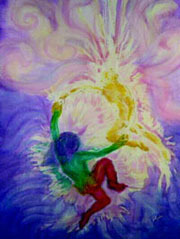 Remove and transmute occupants (thought form entities from unseen dimensions that think they own your body), clusters of harmful entities dwelling in your auric field, portals and micro-black holes (that attract discordant energies to your Light Body and make it easier for people to unload their undesirable energies onto you). Disconnect from your field discarnate beings that have attached to you and are helping to perpetuate discordant energies in your life. I do not "take these off" of you. Rather I help you to release the old energies that you are holding on to, from this or other lifetimes, that are making it possible for outside entities and energies to attach to you. I can help you to let go of thought forms you have created that are running your life. Once you release the attitudes that are holding all of these energies and entities in place, they fall away. They are sent to higher levels of awareness to continue their own evolution. I can only help you to release that which you are ready and willing to release. All is done under the guidance of your own I Am Presence, or higher Self. No one is a victim. We create our own lives. We create the situations we find ourselves in. If we do not particularly like these, then it is time to start creating consciously what we want, from our Love, instead of creating unconsciously, from our fears. It is time to release the fears and attitudes of hoarded traumas stemming from many lifetimes over hundreds, even thousands of years. It is time to remember our own divinity, to finally be here now and live in the present. What I need from you: your name, city and country of residence, birth date, as well as your willingness to release. Also send a brief description of what you are currently working on, if you like. I don't promise to deal with karmic issues during the session, but it is good to know some of your background and current state of mind. With this information the God within you will allowmes to locate you easily and remotely clear your auric field. After you have had an Auric Clearing from us you may schedule one or more Karmic Clearings if you would like to. Payment by check, money order or PayPal accepted.